When we think of invasive species, we tend to think of the exotic: Burmese pythons, Asian carp, or any of the bizarre creatures terrorizing Florida. But the truth is, our beloved cats can also be bad news for other species. The exclusive gated community of Ocean Reef Club in Florida is home to some of the state's wealthiest residents—and what was once the state's largest feral cat colony. Originally introduced to deal with a rat problem at the club, the cats eventually multiplied to number over 2,000. To combat this feline infestation, Ocean Reef set up a trap-neuter-return program, dubbed ORCAT, after which their numbers dropped to a more manageable 350. ORCAT still feeds and care for the remaining cats. An article in Best Friends Magazine from 2009 describes how ORCAT's director makes the rounds at 70 feeding stations daily in a golf cart, greeting the cats as they approach: "Shelley, a black and white tuxedo, meets her feeders at one station and then jogs with the golf cart to the next station. Henry, a shy, old tom with scarred ears, comes running with a spring in his step when he knows he's getting his wet food. And then there's Jellybean, a round black cat, who meows loudly when the golf cart approaches." On one hand, this is a success: 350 feral cats is a lot better than 2,000. 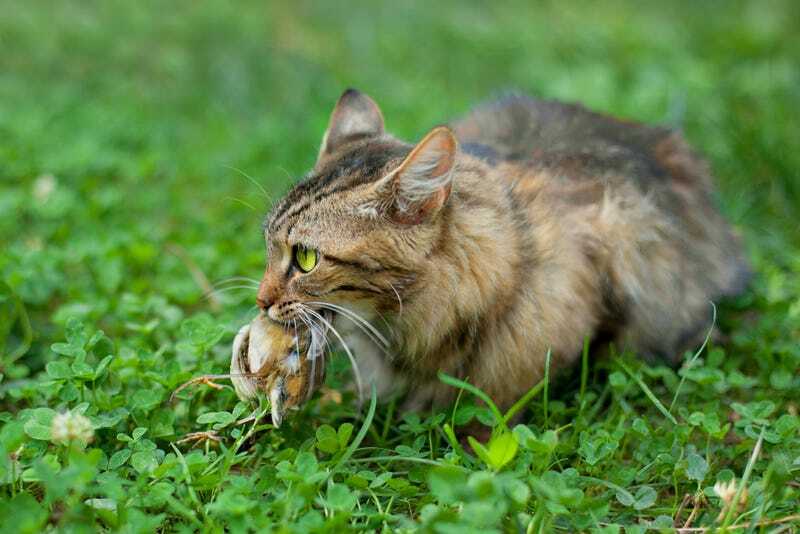 On the other hand, that's still a lot of cats, and even well-fed cats will hunt—out of instinct rather than hunger. On protected land right next door to Ocean Reef Club, for instance, is the only habitat of the Key Largo woodrat, a threatened animal whose entire species numbers in the few hundred, if even that many. As a last ditch effort to save the Key Largo woodrat a decade ago, the U.S. Fish and Wildlife Service established a captive breeding program. The furry little woodrats were raised first at Tampa's Lowry Park Zoo, then later at Disney's Animal Kingdom before finally being released into the wild. The captive breeding program was never quite successful though, and it was abandoned in 2012. Recently, scientists published a evaluation of the program's failure in the journal Biological Conservation. As journalist Richard Conniff points out, however, the new paper leaves out the biggest controversy surrounding this conservation program: cats. To be sure, other factors like habitat loss have a role in threatening the woodrat, but biologists think the cats certainly don't help. "It's a very serious problem for Key Largo wood rats," wildlife scientist Frank Mazzotti told the St. Petersburg Times in 2003. "Releasing a feral cat in a natural area is like releasing a serial murderer in a maternity ward." Cat lovers, however, dispute that felines are at fault. This is a story about bison, Hollywood, and a glycoprotein.